Harma Deep Cryogenic treated valves offers improvements to the sonic character of the valves and results in sound characteristics only normally found in very expensive NOS valves such as Mullards. The process involves taking the vacuum tubes and freezing them down to -312 Fahrenheit and soaking these for a minimum of 12 hours. Then the temperature is held at this low level for 24 hours. The vacuum tubes are then slowly brought up to normal levels over the next 12 hours. Metals respond very well to deep cryogenic process. The reasons are as follows, during the cooling or solidification phase of the manufacturing process, molecules are trapped in a haphazard pattern. This is down to stress caused in the bending and welding of the anode plate material. This random placement causes obstacles for electrons and when encountered this interference can cause noise, slow down electron flow and sound deterioration affecting the quality of the sound of the vacuum tube. .
At very cold temperatures (below -312 Fahrenheit), the molecules will align in a more uniform, compact structure through the removal of kinetic energy. When the material is returned to ambient temperature, this new uniform, compact pattern is maintained, Thus changing the structure of the nickel permanently. This process makes a permanent change and the benefits do not deteriorate over time or upon return to operating temperature, it changes the whole way the vacuum tube performs. The biggest benefits I have found have been a dramatic improvement in the sound quality. The bass response has been clearer with reduction in microphonics and clear more transparent highs. Cryogenic treatment has now become a way for a modern valve to produce a sound quality that approaches the iconic originals. The Harma 7025 Dr250 High Gain Cryo is the perfect valve where clarity and gain are the main requirements. This valve has been designed to have a upper midrange peak which gives the amp a nice early crunch. The valve is biased on the famous USA made 7025 and has a spiral filament to prevent hum and can be used when the heaters are wired for AC or DC. Sound wise the 7025 has a nice clear sound which has a clean and open treble which is ideal for that bright sparling top end sound. The midrange is warm and full which gives nice fatness to single coil pickups. 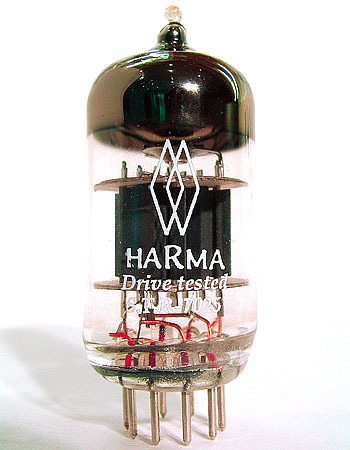 The Harma 7025 is selected for high gain and is ideal for all modern and vintage amps. These selected valves all measure up to the 7025 specification and can be fitted in the most demanding positions. Each part of the triode will have a rating of above 250 on our rating system. Installing this valve will give you an immediate upgrade.